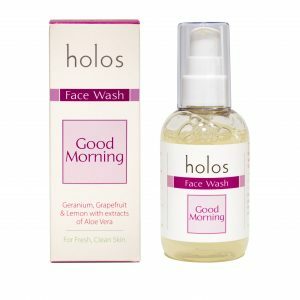 Good Morning range by Holos will energise you and your skin. It balances sebum and encourages circulation. Good Morning line is made with lively essential oils of Grapefruit, Lemon and Geranium. Created for a young, oily or combination skin. Perfect for morning time use but is not restricted to this so can be used any time. This combination of essential oils balances sebum, encourages circulation and energises our skin and ourselves. Good Morning Body oil Perfect for after the morning shower. (Sweet almond oil, Geranium, Grapefruit, Lemon).